Location is everything, and Oahu is the only locale you’d consider for the home of your dreams. We’re committed to helping you find that perfect condo or house in the right neighborhood at the right price. Whether you seek the surf or the big city life, it’s all here on the third largest of the Hawaiian Islands. You’ve chosen to live in a paradise called The Gathering Place, which most people known by the name Oahu. Where else can you experience a consistently pleasant climate, insanely blue water, a rich culture and history, and some of the most spectacular forever views anywhere in the world? Some call Oahu the tropical vacation of their dreams, but you are ready to call it your home. 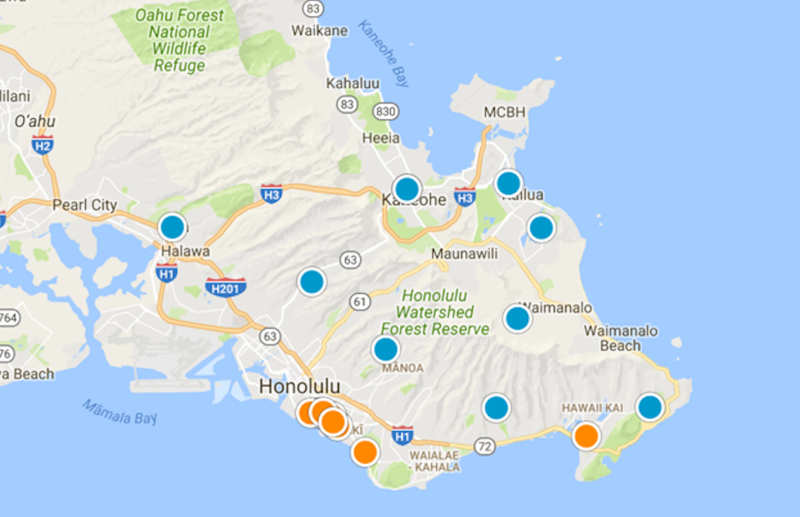 Let us introduce you to the homes for sale on Oahu as you get to know the neighborhoods that appeal to your lifestyle and budget and navigate an ever-changing real estate market. Take advantage of living in the revitalized commercial and warehouse district by looking at condos for sale in Kakaako. Be a part of the hipster and young professional community who are creating the synergy that comes with living in one of Oahu’s most vibrant condo locations. Choose Kakaako as your home, and you’ll live close to work, shops, restaurants, entertainment and recreation venues. You’ll also be part of a growing neighborhood that’s making Kakaakao one of the most popular and in-demand areas on Oahu, nestled between Kewala Basin and the northern suburbs on the edge of Honolulu. Expect to pay an average of $920/sq. ft. for 1200 square feet of prime living space. Residents in Honolulu treasure living in an urban metroscape that combines tropical landscapes with city architecture on one of the most pristine islands in the world. Honolulu is classic Hawaii. Upscale luxury condos take center stage in this downtown urban hub, and residents live and work amidst fantastic amenities and glorious views. Cultural activities and culinary hot spots greet you with the island-style casualness you expect. You’re close to the state capital, an energetic nightlife and Chinatown when you make your home in a Honolulu condo. The Honolulu condos for sale average $619 square foot, and the average condo size is 870 sq. ft.
Homes for sale in Kaneohe disappear from the market as quickly as they appear. Homebuyers snap these homes up quickly due to its location and easy access to town. That’s because Kaneohe is a favorite residential area for raising a family in the suburbs. Both white and blue collar workers make this coastal town their home, and the diversity in the community here is some of the best anywhere. One-third of the population is college-educated. Homes for sale (1900 sq ft) in Kaneohe average $420 square foot. It’s all about the marina when you live in Hawaii Kai. Hawaii Kai homes for sale offer incredible vistas. Choose from ocean, Diamond Head or mountain views or even beautiful views of the marina. The benefits of living in this exclusive community include superb shopping opportunities and highly rated medical centers. Children growing up in Hawaii Kai benefit from attending some of the most outstanding schools anywhere. The biggest benefit of living in Hawaii Kai is that if you can do it in or on the water, you can do it here. And you’ll do it from a well-appointed, single family home. Expect to pay an average of $622 per square foot for a home in Hawaii Kai. Interested in Viewing a Property? Contact us today so we can help.